Replaces your original gravity water fill. Made of durable plastic for long life. Plastic will not fade or discolor and resists UV rays and road salts or acids. 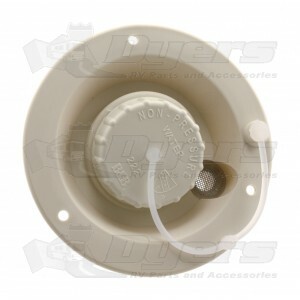 Easy installation with three screws and comes with a cap, strap and spout. Dish has a 1/2" screened air vent for better water filling. Cut-out: 3-1/2"D. O.D. is 4-1/2" D.
Perfect fit in size and color and easy to install.